Arun did his graduation from the National Law School of India University, Bangalore (BA. LLB (Hons.) in 1995. Arun’s corporate practice includes advising venture capital, private equity and investment funds and has developed the capital markets group which specialises in public offerings in India and abroad. 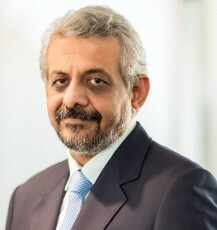 Arun has extensive experience working with stock exchanges and public markets across the world and has advised numerous companies in accessing the Indian capital markets through IPOs (Initial Public Offerings), FPOs (Further Public Offerings), rights issues and QIPs (Qualified Institutional Placements) as well as acquisition of share governed by the SEBI SAST Code. Arun has also worked on domestic issues listed on the BSE (Bombay Stock Exchange) and NSE (National Stock Exchange) additionally, international offerings on the LSE (London Stock Exchange), including the AIM (Alternative Investment Market), LuxSE (Luxembourg Stock Exchange), NYSE (New York Stock Exchange) and ASX (Australian Stock Exchange). In the recent past Arun has been working with companies seeking to access the markets on DFX (Dubai Stock Exchange), SGX (Singapore Stock Exchange) and Tokyo MOTHERS (Market Of The High-growth and Emerging Stocks). Arun has worked with most of the leading book runners and merchant bankers during his transactions on the various stock exchanges that in India and abroad. Arun continues to advise and work on his known expertise of mergers & acquisitions, including cross border transactions. Some of the recent transactions which have received significant importance and he has advised deals worth over USD 1.2 Bn till date. Arun previously worked with Digital GlobalSoft Limited (now Hewlett Packard ISO), India and United Arab Shipping Company (SoAG, Kuwait). During his initial days of practice he has authored several articles and research papers relating to private equity, venture capital and information technology. He attends seminars & preparatory clinics on laws relating to capital markets. Arun has extensive experience in the technology and IT enabled services sector. He also serves as a Director on the Board of several well-known technology companies. The Chambers Partners and Asia Legal 500 rate him as one the leading practitioners in his areas of practice. COMSWARE and Indian Council of Arbitration (New Delhi).